Quadcopter Stalls. The streamline colors in the picture above indicate airspeed. When you have clean air entering the rotors, you have nothing that will oppose the flight of the UAS....it's just straight line wind. As air enters through the props, air is pushed through and down, causing rotor turbulence. Clean air is the air coming in, it hits the rotors, twists, and turns, and becomes dirty (also called rotor wash.) Flying a drone in the dirty air reduces lift and can lead to stalls. Stalling occurs when the air that passes through the rotors is disrupted. This is usually caused by hovering and descending rapidly into rotor wash. The copter will ‘dance’ on it’s (Z) axis as it slowly falls into its own wake. In-place flight increases stall risks. Move the air frame out of the rotor wash to reduce the likelihood of a stall. 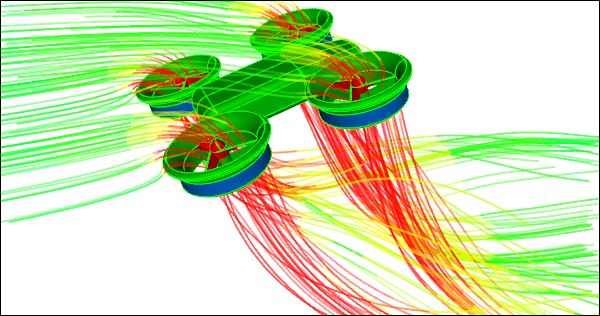 Wake turbulence is one of the main reasons a quadcopter will crash! Fixed Wing Stalls. This will occur when critical angle of attack is exceeded. Can occur at any airspeed in any flight altitude. This entry was posted in Drones and tagged drone, Drone Stalls.